Help sponsor a home or part of a home, maybe a water filter. Assuming the source water cannot be cleaned then the solution is to provide an end user option that does not sacrifice any more of the household budget than is necessary. For a one time investment in a simple hollow fibre membrane filter your typical Guatemalan family can improve their health and household economy – whose factors are of paramount importance for the progress and development of any country. In most cases the filter will pay for itself in saving the cost for bottled water and/or the firewood and gas expended to boil water, within the first 5 months. The graphic below shows just what the hollow fiber membrane technology will remove. 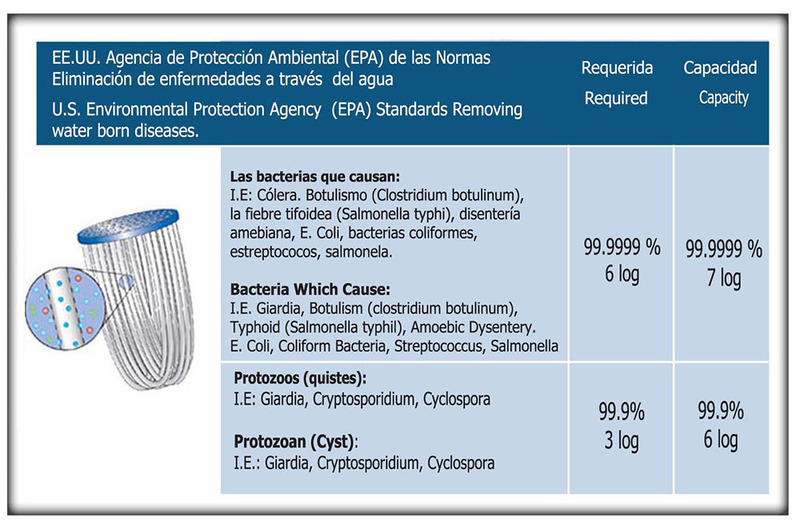 While this report is in Spanish, the key element to note is the removal of the 1600 particulates per 100ml of contamination with the use of the hollow fibre membrane .01 technology.